ROMANCE BOOK PARADISE: Soraya Lane with a Giveaway! Soraya Lane with a Giveaway! Today we welcome New Zealand author Soraya Lane who also came bearing gifts! I’ve had a lot of reader feedback on my latest book, Back in the Soldier’s Arms, and most of it has been overwhelmingly supportive. The odd person has been offended, and I can understand why … because it deals with the difficult issue of infidelity. While I certainly don’t know if I could ever forgive my husband if he was unfaithful, I am a realist and I understand that some partners can. Is it worth throwing away years of marriage for one mistake? Is it possible to truly forgive and move forward? Is it realistic to believe in second chances? These were all questions I asked myself before I started writing, confronting what is potentially a reality to many couples around the world. In the case of Penny and Daniel, it turned out that their marriage could be saved, but it certainly wasn’t a decision that Penny made lightly. I don’t think that anyone would find it “easy” to forgive a partner for being unfaithful, and Penny and Daniel’s journey was certainly a tough one to write! I would go as far as to say that it was the most difficult story I’ve ever attempted, and there were times when I wasn’t sure I could do it. But I absolutely adore the book in its finished form, and I would go so far as to describe it as my favorite to date. 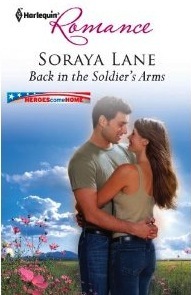 Back in the Soldier’s Arms is part of my Heroes Come Home series – heartwarming, emotional stories about soldiers returning from war. I’d like to give away a copy of this story, so leave a comment to be in the draw. And if you already have Back in the Soldier’s Arms, still leave a comment … if you’re the lucky winner I’ll send you a book from my backlist instead. I can see both sides of the coin on this one. I would think it would come down to how much BOTH partners want to remain married to each other, despite this indiscretion. Obviously, it would be more difficult for Penny in this case, so I'm eager to see how this story played out. Soraya, I'm not sure this is a subject I could write about without a heap of serious thought - good on you for tackling it. And for that reason, it intrigues me and I would pick up this book. I like unconventional topics. :-) Not to mention the potential for conflict you could be putting our characters through! Great to see your Heroes Come Home series doing so well with readers. Congrats! The topic has captured my interest. I'd love to win a copy of the book. In fact, the series sound fabulous. I'll have to check them out. Thannks for the heads up on a new author Nas. I hope you have a good week. I've a copy of this book and also Rodeo Daddy in my TBR pile. I admire your courage in tackling this matter in a book. I, like you, could never take infidelity lightly, but at the same time, throwing away a marriage is something else altogether. This is certainly a hot button for most readers, and it would depend on the set up and the situation. Good luck with your release. Oh Soraya! I cant believe I have been so rude and forgotten to thank you! I was very kindly sent a copy of Back in the Soldier's Arms (with the bonus of it being a double book, it was so fab to receive something apart from a bill in the mail). When Im lucky enough to have a book sent to me I usually read the first couple of pages then later find time to sit down and read it. What was that saying... Nek Minit...? Well! Nek Minit - three hours later I finished it. I loved it and along the way found myself wishing/hoping Daniel and Penny do get their happy ever after. We all know the books do end happily but I think any author has done a great job if I find myself wishing for a happy ending. i think every one should get a second chance even sometimes there is not all people will appreciate the second chance. so pity. The book sounds incredible , I adore hero come home stories ,my own dad served in Iraq for 4 years so I personally know how hard it is to have someone you love far away. And stories like these really touch home for me and I simply adore reading them ! Thanks for the great post Nas and thanks Soraya for coming to visit and thanks for the chance to win your book ! I have two nephews that are in the military. They have both served in the Middle East. They are heroes in my eyes. We missed them and worried about them all the time. Thank you! Sounds like a great series! Thanks Soraya and Nas! Wow, thanks for all the comments! Interesting that you all seem open to the idea of reading about a second chance, because on some review sites it seems to have angered a few people!! I'll pop back tomorrow to pick a winner. I don't know how I'd react if someone cheated on me. Probably not in a good way! But after cooling down (and dependent on the siutation), I would hopefully remember that I believe in second chances, that I've made tons of mistakes in my own life, and that sometimes a marriage/relationship can be saved. Also, I jumped the gun a little saying I'd make the draw today - it will be announced on Sunday. I can see how it would be a difficult story to write. You have me intrigued. I think this would be a difficult story to write. It sounds like an interesting book. Hi, Soraya! I remember you from some blog posts on Harlequin's website, I think. Don't worry about entering me in the draw, I only read ebooks... I just wanted to make a comment about some of the dismay you noted on review websites. Part of the universal (to women) appeal of romance novels is the escape from reality, along with the happily ever after. In a tale of infidelity -- even if resolved in the HEA -- there's rather a lot of reality to cope with. I often think some alpha heroes are rather a lot to cope with! However, the alpha does represent the ideal which appeals to our biology and subconscious. Infidelity is the diametrical opposite of that ideal. The book A Billion Wicked Thoughts, and the related study which was a graduate research project, provide some valuable insights into what it is about romance novels that appeals to women. So if you're curious to have some understanding of the reactions to infidelity in your book, you may find it an interesting read. LP, thanks for your post. You're absolutely right of course - anything that reminds you of your own reality doesn't make for a great "escapist" type of read! Thank you all for your great comments. Now it's time to announce the winner ... Desere! Congratulations, email me via the contact page on my website with your address and I'll pop a copy of Back in the Soldier's Arms asap. Thank you so much Nas and Soraya this is so incredible !!!! !